Dr. Savitha Shetty has obtained her MBBS from Kasturba Medical College, Mangalore, India (MAHE – Deemed University). She later obtained her Diploma in Gynaecology & Obstetrics (DGO) from Kasturba Medical College, Mangalore, India. 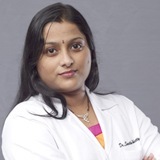 Dr. Savitha has also passed her MRCOG (Part 1) in 2005. Dr. Savitha started her career as a Medical Officer at the A J Shetty Institute of Medical Sciences, Mangalore, Karnataka, India. After that she joined the Department of OBG, Kasturba Medical College Hospital, Mangalore, Karnataka, India as a Resident. In 2008 she became the Senior Resident at the same institute. After her time with Kasturba Medical College, she joined NMC Healthcare in 2009 as a Registrar – OBG at NMC Specialty Hospital, UAE. Dr. Savitha is well versed in English, Hindi, Kannada, Tulu and Malayalam.